Here’s how to make beets so that they are not only completely tender, but extremely sweet. Cooking them slowly at low heat caramelizes the sugar in them and makes them taste almost like dessert. I take a shallow pan, I use a ceramic one, and I cut the stems off the ends and trim any extra stuff. Do not peel them. Now here’s the part that will seem unbelievable. You set the oven at 275° and you put them in uncovered, and you bake them for about three hours. Depending on the size of the beets, you can shave a half an hour off if they’re extremely small or you can go as long as four hours for very big beets. Take out, peel, and slice. They’re good warm or room temp. Or cube them for salad. Anyway you cut them, they’re really good. All we add is salt and pepper, or a drizzle of balsamic vinegar. What’s so great about beets? Read the health benefits of beets HERE. I always appreciate your tips. Low and slow it is! My favorite vegetable too! And thank you for writing these important posts, Eileen. Thanks for the tips. 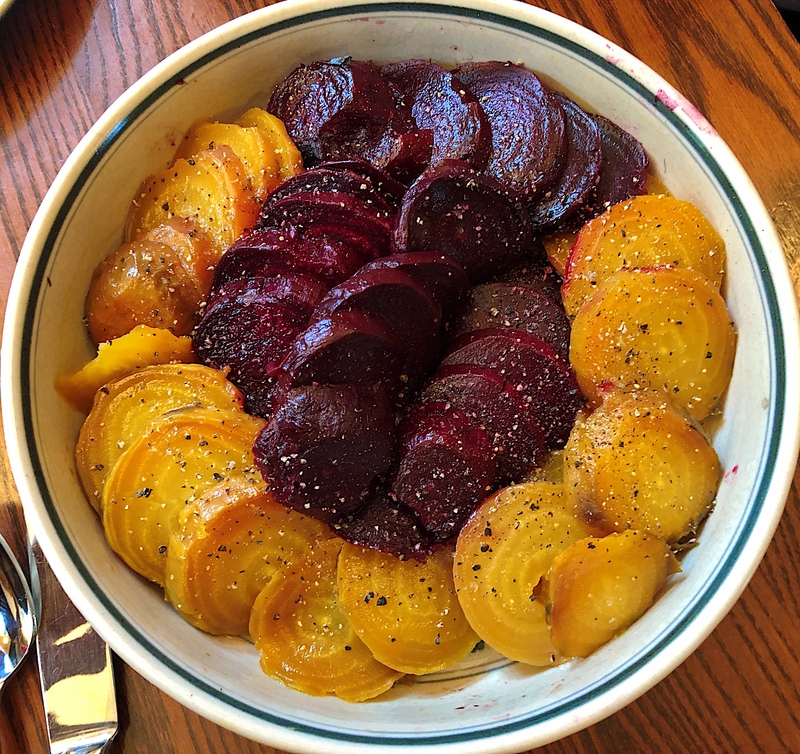 We love beets- esp golden beets but they are hard to find. Where do you find them? Locally, I get them through an organic CSA we purchase each summer, but local farmers markets, food co-ops and grocery stores should be getting them in now. The season for beets is mid summer to fall, so we’re in luck! They also keep for months!